Fort Lauderdale Bartending School | Training Fort Lauderdale, Hollywood, Boynton, Delray Beach and Boca Raton Bartenders. Welcome to our Fort Lauderdale Bartending School! The New York Bartending School of South Florida is licensed by the Florida Commission of Independent Education, License #3301. The South Florida Bartending School Serves Ft Lauderdale, Hollywood, Miami, Boca Raton, Boynton and Palm Beach! 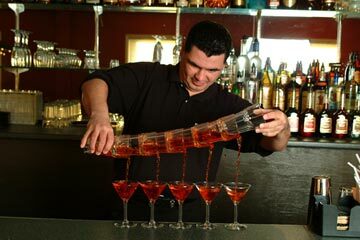 At the South Florida Bartending School, we will teach you much more than the basics of bartending! We can get you ready to work in only 1 or 2 weeks! Training at our Fort Lauderdale Bartending School will be like learning behind a REAL BAR! Each station is FULLY equipped! Our school has been featured on local, national and worldwide TV and recognized worldwide as a reputable bartending school. Take a free hands-on intro class and then we suggest you go and check out the other Fort Lauderdale bartending schools and see the difference for yourself! At our Fort Lauderdale Bartending School, we allow you to sit in on a class whenever you want, take a NO FEE trial hands-on class, talk to the students, past graduates, instructors and job placement staff, with no fee, pressure or obligation to sign up. Afterwards we suggest you go and check out other bartending schools and COMPARE the difference. Because the RIGHT training REALLY does make a difference! Bartending in Fort Lauderdale, Miami, Hollywood and Palm Beach can be a tough world to break into. Corner bars with on-the-job training are few and far between. South Florida customers are more educated and sophisticated than ever before. They come from all over the world, they know about wine, they enjoy the scene and they have become more demanding. The South Florida Bartending School in Fort Lauderdale has created programs to answer the demand for professionally trained bartenders. We provide the bartending education, the speed, the organizational skills as well as customer service and alcohol awareness at our Fort Lauderdale campus. Then we will follow up your training with our proven job placement program. Take the time to check out all of our pages and then TAKE THE NEXT STEP! Request more information on our Fort Lauderdale bartending school or call us today and we will show you how we can help you get started in your new bartending career!